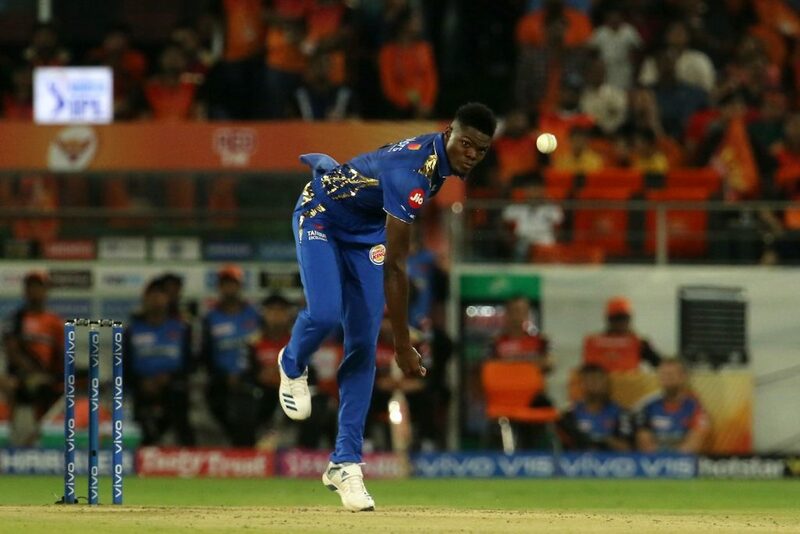 Alzarri Joseph made an impressive debut in the Indian Premier League by claiming 6/12, as Mumbai Indians defeated the Sunrisers Hyderabad by 40 runs at Rajiv Gandhi International Stadium, Hyderabad on Saturday. Mumbai included Ishan Kishan and Alzarri Joseph for Yuvraj Singh and Lasith Malinga who has gone back to Sri Lanka to play in a domestic event, while Hyderabad went in with an unchanged line up. After being sent into bat by SRH skipper Bhuvneshwar Kumar, Mumbai Indians opener Rohit Sharma in the first over survived an LBW chance and was dropped by Siddharth Kaul at third man. However, the skipper failed to capitalize on the opportunity as he was dismissed by Mohammad Nabi for 11. Sandeep Sharma got into the act by claiming the wicket of Suryakumar Yadav in the fifth over. The visitors suffered a major blow as Quinton de Kock perished for 19, leaving them struggling at 43/3. The pair of Krunal Pandya and Ishan Kishan added 20 runs for the fourth wicket, before the latter top-edged a pull straight into the hands of Jonny Bairstow. Hardik Pandya took on Rashid Khan by smashing him for a maximum over long on. However the leg spinner came back with a bang by claiming the latter who was caught at deep mid wicket by Vijay Shankar. Kieron Pollard made a valuable contribution by scoring an unbeaten 46, and added 39 runs with Joseph to help Mumbai Indians post a respectable 136 for 7 in 20 overs. Kaul claimed 2/34, while Mohammad Nabi, Sandeep Sharma, Bhuvneshwar Kumar, and Rashid Khan took a wicket each. Chasing 137 runs to win, David Warner and Jonny Bairstow got SRH off to a flying start, by adding 33 runs for the opening wicket, before Rahul Chahar dismissed Bairstow for 16. Alzarri Joseph in the next over claimed the prize wicket of David Warner on his very first delivery. Manish Pandey and Deepak Hooda weathered the storm for a brief while, before the former was caught by Rohit at mid-wicket off Jason Behrendorff. Chahar in the 12th over dismissed Yusuf Pathan back for a duck, as the home side were struggling at 62/5. The 22 year old West Indies fast bowler dashed Hyderabad’s hope of victory by dismissing Deepak Hooda and Rashid in successive balls. He also scalped the last 2 wickets, as Sunrisers Hyderabad were bundled out for 96 runs in 17.4 overs. The 20th match of the Indian Premier League will be a double header with Royal Challengers Bangalore taking on Delhi Capitals at Bengaluru, and Rajasthan Royals squaring off against the Kolkata Knight Riders at Jaipur on April 7.